The Star Nation Language appears in orb photos, crop circles, holograms of pure light, cymatic symbols, crystal skulls, megalithic sites, ancient pictographs and petroglyphs all over the world. Connecting the dots between the Star Nation Language, also referred to as the Ancient World Wide Language, and these various forms of communication with the multiverse is one of the purposes of this Galacticfacets website. 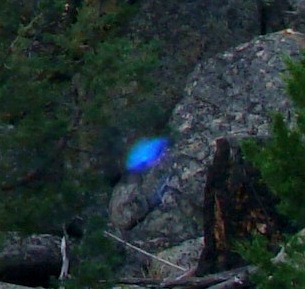 In 2003, I photographed a Blue Orb Being at a Human-Fairy Congress in Washington State. I published this photo on this site in 2011. Corey Goode has released a series of video interviews with David Wilcock in which Corey describes his experiences traveling in the Blue Orbs. Mirror imaging of the above photograph produces a complete oval. With my permission this image was featured on a DVD produced in 2004 by one of the men in the original photograph. Responses to this image vary depending on the belief system of the observer. There is generally a few moments of silence followed by a sense of excitement as each person discovers their own interpretation. Read more about the Blue Orb Sphere Being and the relationship to Cymatics and ancient technology on the Ancient Technology Page. David Wilcock and Corey Goode explain that life precipitates out of the quantum vacuum and in it's primordial form is a blue sphere. I caught the image of exactly half of the Blue Orb Sphere Being in the original photograph which is shown here. Dorothy Maclean, the originator of the famous Findhorn Gardens in Scotland, had spoken about contact with the Fairy Realms earlier that day. Many of us were still dressed in fairy or wizard costumes as we cavorted and danced with the orbs. Years later, late in the afternoon, a beam of aqua blue light penetrated the ridge overlooking the Fairy Garden at Tizer. 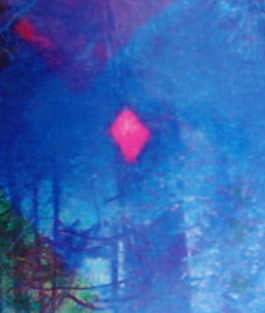 A magenta diamond portal opened just before the second appearance of the Blue Orb Sphere Being. Corey Goode explains that the Blue Orb Sphere Beings are in a symbiotic relationship with humanity and our co-creative consciousness. I had asked for another visit from this inter-dimensional Sphere Being. My wish was granted. At an annual Fairy and Wizard Festival in Tizer Gardens outside of Helena, Montana in the USA, the Blue Orb Sphere Being appeared a second time in the center of three blue orbs. This time I photographed the complete image although it was much smaller than the first appearance at the moment this photo was taken. The thick membrane was intact around the central figure of the Sphere Being just as in the first photograph taken years earlier. The following quote from Corey Goode succinctly describes my actual physical as well as my intuitive experiences with the Blue Orb Sphere Beings: "The Sphere Alliance are 6th through 9th Density Beings. When they are not here interacting with us they are either back at their home density or are around us in a phased out (Different Frequency) state that makes them invisible to us. They observe and interact with us at will and then travel back to their home Density by just a “Thought”. Many of our Density are having a very difficult time understanding the existence and abilities of a group from 6th through 9th Density Realities. We have no way to begin to fathom the way they perceive us or our behavior in our Density. Everything is Vibration… Energy, Matter and even Thought is all Vibration. They can control matter and energy’s vibrational state by their thought/consciousness and without the need of technology." (62 mile) wide earth energy grid corridor that circumvents the globe. Within this corridor still stands a series of dolmens. In the mountains above Tizer Gardens stands the Tizer Dolmen which is the tallest of the dolmens discovered so far in Montana. 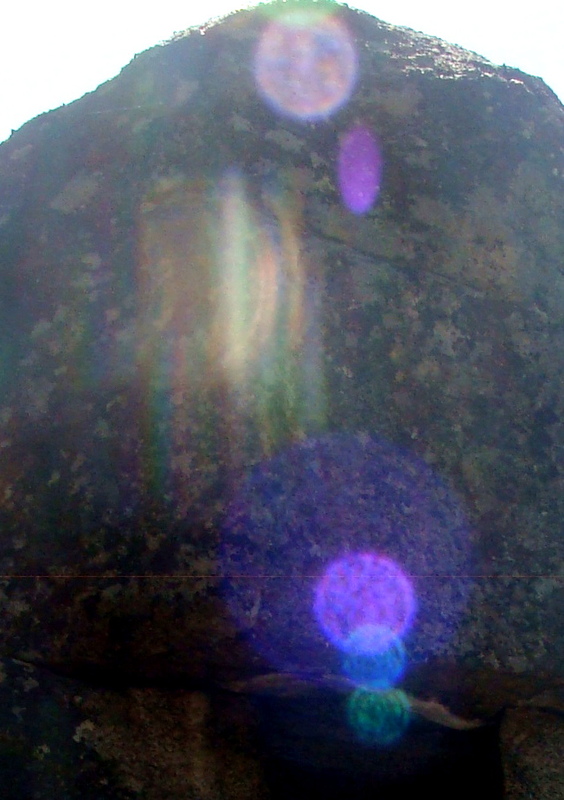 Striped orbs in different colors began showing up at the Montana Megaliths in 2016. I named them bar code orbs as they reminded me of digital bar codes indicating numerical information that could be scanned. The colors are significant data relating to the frequency of each color and the musical notes represented in a progressive pattern. 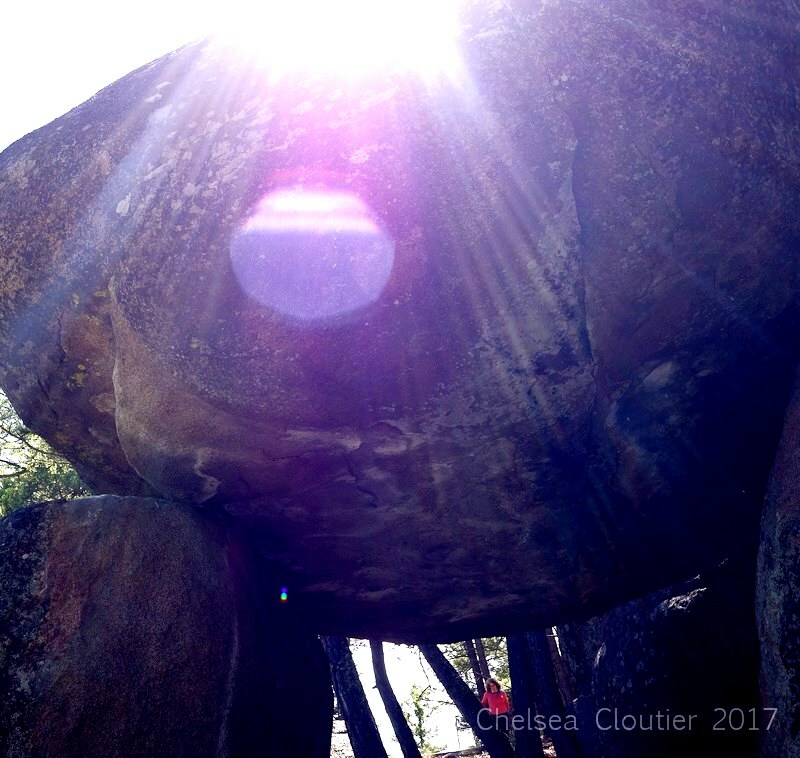 Julie Ryder at Cloud Catcher at the Montana Megaliths. Balls of light and light phenomena occur when gravity is being transformed into electromagnetic energy. 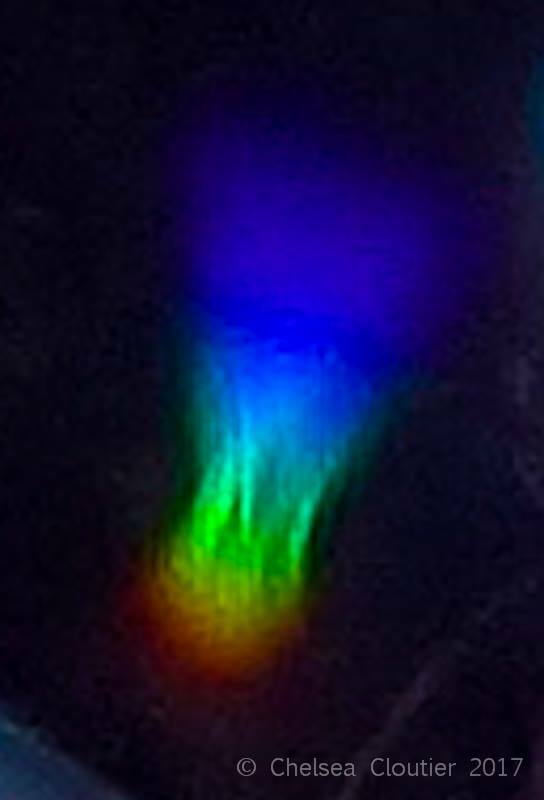 These Natural Self Luminous Formations (NSLF) create a torsion field where the disturbance of the flow of time forms into portals and natural star gates transforming DNA and consciousness according to Dr. Aleksey Dmitriev. These strange balls of light occur when electromagnetic energy is being changed into gravity and gravity into electromagnetic energy especially along ley lines where the electromagnetic energy is highest. This transformation sometimes creates a visible light according to David Wilcock. Notice that in the purple NSLF photo above my head at Cloud Catcher there is a darker circle in the center of the larger ball of light creating a classical torsion (donut) shape. 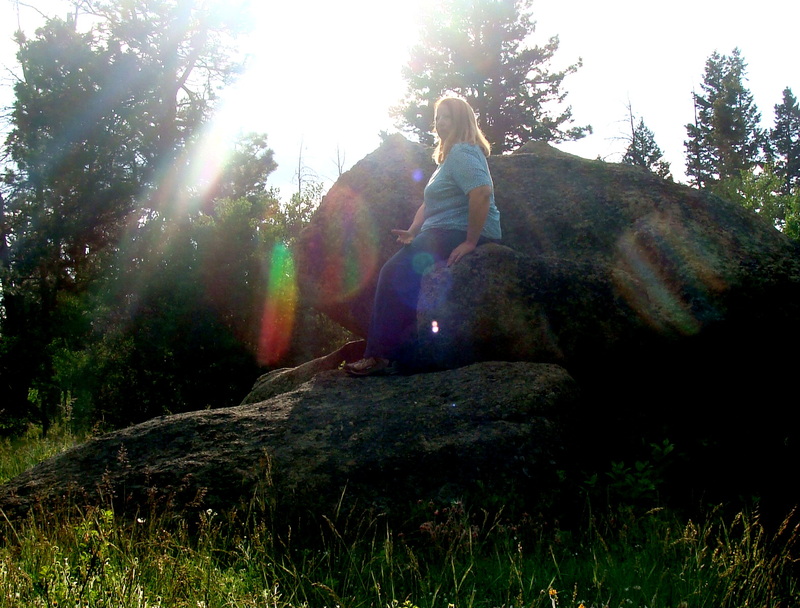 Chelsea Cloutier took these photos of NSLF at Boulder Dolmen after a stone grid ceremony. 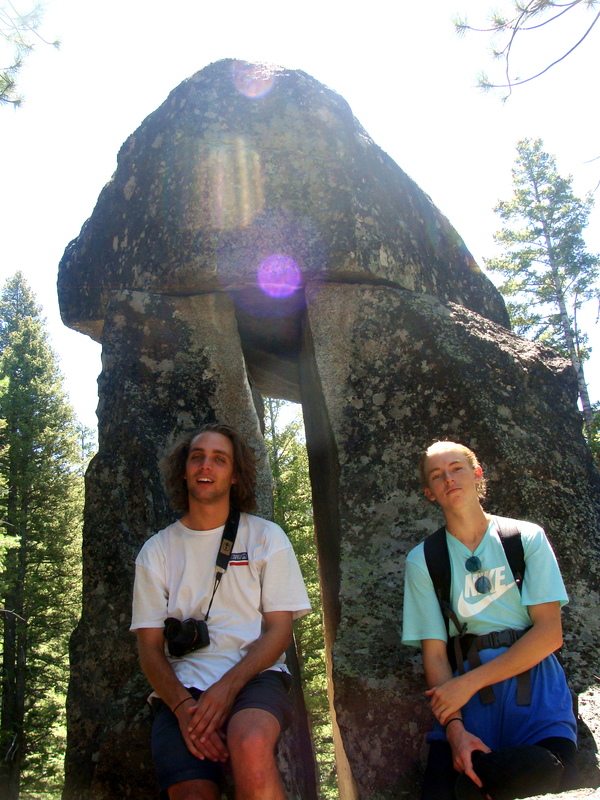 Nick and Tucker are featured in 13 photos in a row with the Bar Code Orbs above their heads on the back side of the Tizer Dolmen in the summer of 2016. 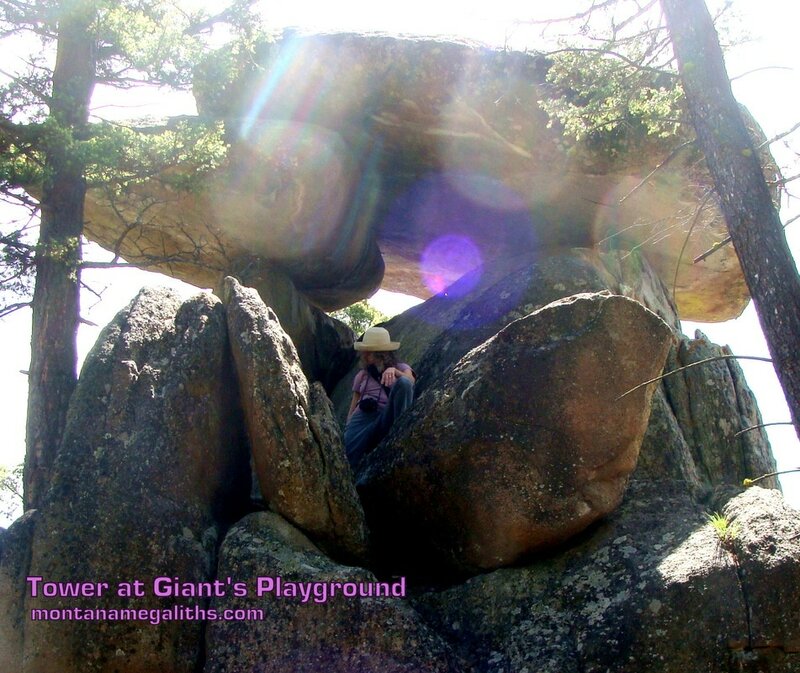 A blue fan shaped light appeared at Giant's Playground Phase Three the day after Nick and Tucker searched this same area for an entrance to underground. Some of these photos appear to be lens flare. We have taken several photos at night, with and without flash, on 35mm film, and in a variety of double blind experiments that feature orbs and light phenomena. The shapes and colors of the light forms are often personally significant to the people in the photo. 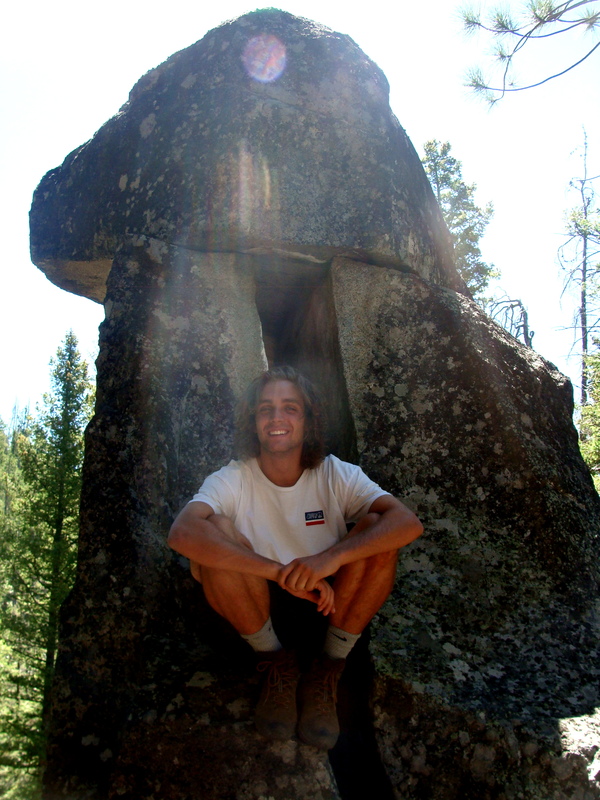 Nick Tenney who is majoring in photography at MSU, insisted I take photos with his camera in the shade and the same orb phenomena showed in several photos at the Tizer Dolmen. 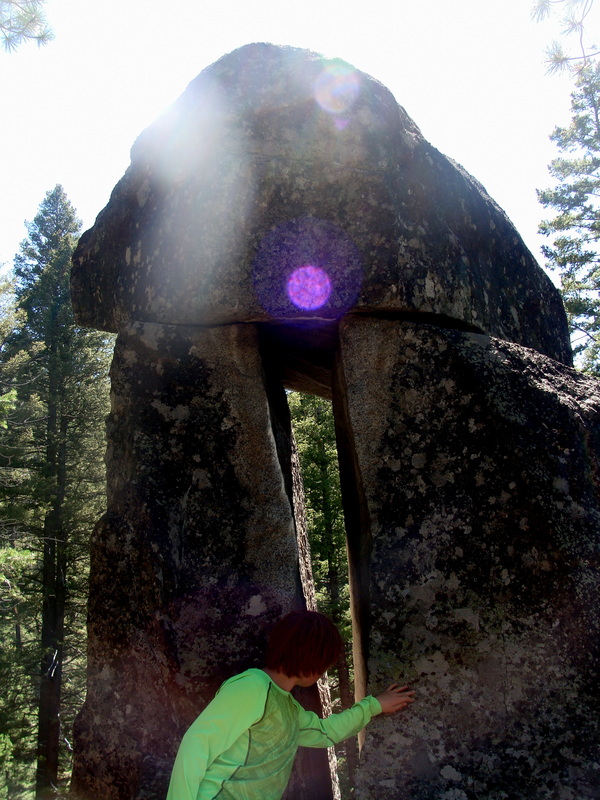 Diamond shape portal opening at an ancient pictograph site in the Judith Basin in Montana. I took this photo just after a ceremony. 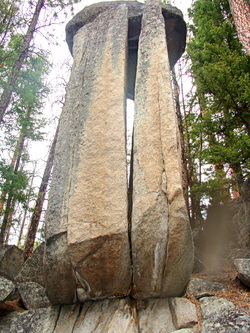 We visited Randy Mead a few days after the original Blue Orb Sphere Being was photographed in Washington State in 2003. The photo above is number four in a series of six taken by Hope Mead. 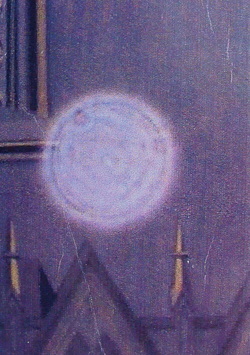 These orbs appeared at the same time as the Blue Orb Sphere Being yet miles away. Randy reports that he was experiencing "direct contact". Hope and Randy made the first orb video titled Orbs the Veil is Lifting. "We live in the midst of other dimensions that our eyes alone cannot perceive. New technological advances have confirmed what many have believed—that there is more to our world than meets the eye." My husband took these photographs at a gathering at our home. The conversation that night revolved around the interaction of orbs with consciousness. My theory is that orbs are manifestations of inter-dimensional consciousness from the quantum matrix that are communicating with us. 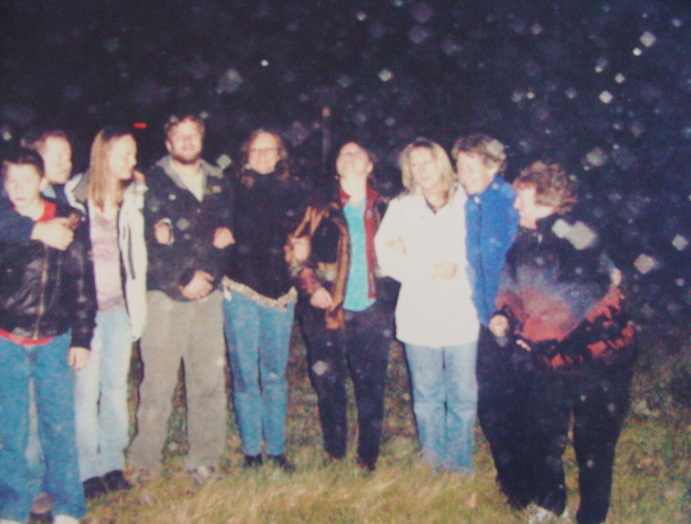 We invited the orbs to appear and when Bill verified that this photo contained circular orbs. I very loudly instructed the group to "request diamonds". A few seconds later the sky was filled with diamond orbs. We have often experienced communication with the Quantum Matrix through photographing orbs. We incubate the event by stating our intention. In the beginning we often asked, "What is the next letter of the alphabet, or show us what comes next". It works better if everyone present is concentrating on the same request. As we learned to trust in our relationship with the orbs we just let it be. When we relinquished control the communication reached a much higher level. Orbs did not appear in every photograph, however at least one orb appeared in every photography session for over 143 sessions. One time we had 27 cameras flashing at the same session. 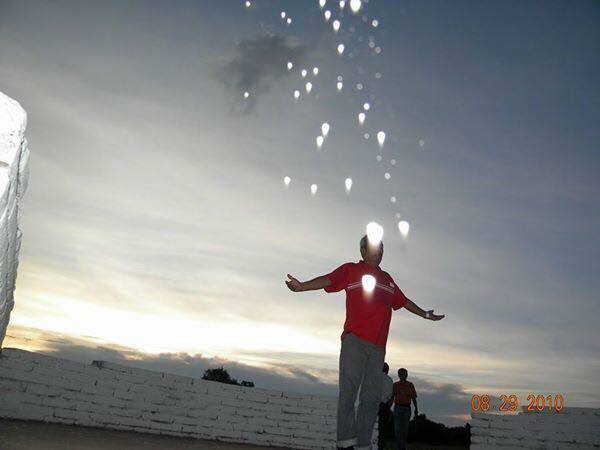 Some people photographed orbs and other people did not. Some people got orbs in every photograph up to 63 consecutive photos and other people got none. One woman who had never taken an orb photo handed me her camera. I took two shots that showed orbs in them and handed the camera back to her. 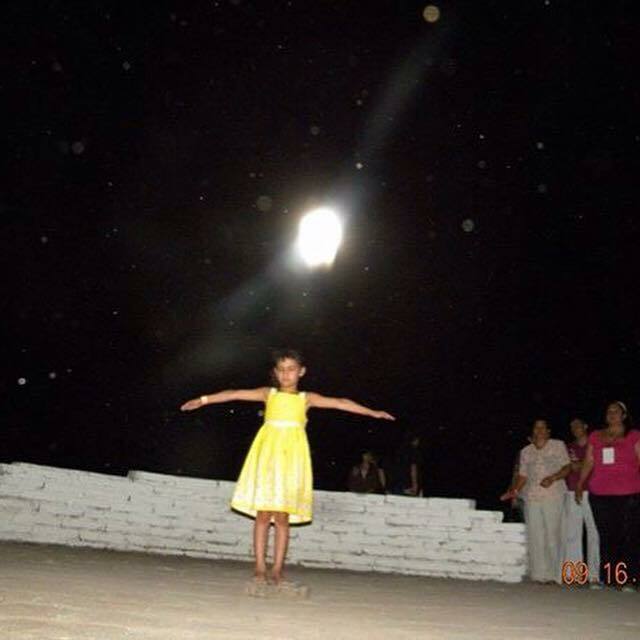 She took numerous more photos and still did not get any orbs in the photos she took. We chalked this up to the Observer Effect explained by Quantum Physics theory. Currently there are two theories about the physical properties of orbs. The first theory categorizes orbs as Subtle Energy, i.e. Prana, Chi, Life Force, Torsion, Bioplasma etc. and the second categorize orbs as Plasma. Ralph Squire from SERI says that "Subtle energy is defined as, but not limited to the following: One or more forms of energy, which do not appear to be within the electromagnetic spectrum. Unknown at this time is the interaction or the impact that subtle energies have on measurable electromagnetic forces, nuclear energy and/or atomic bonds, gravitational effects or mass. Some described energy forms or systems which furnish partial or limited descriptions of subtle energy are: chi, ki, prana, the force, love, kundalini, orgone, space energy, zero-point energy, aura field energy, energy of thought, energy of consciousness, spiritual energy, life-force energy, ether/aether/eter, vril, energy of intention, and intuition. Claude Swanson, Ph.D., author of The Synchronized Universe Series Vol. II states, "A number of Russian scientists indicate that they have developed a rigorous science of subtle energy. It appears to have been verified by a series of experiments, as well as a comprehensive theory, and had led to numerous patents and even industrial applications. They call it "torsion," and it has two polarities, left and right handed spin. Forms of this energy appear to decrease entropy, slow down the flow of time, and promote order within a system. It can therefore be "negentropic," and assist the body in healing. It opposes the dominant tendency of matter, according to western physics, that entropy must always increase. According to these scientists, torsion is produced by the interactions between elementary particle spins, which generate a twisting of space. Russian researchers claim, and have published, numerous experiments to prove that this "torsion" energy is exactly the same as subtle energy. It was first discovered by Russian astrophysicist Nikolai Kozyrev in the 1950's. Russian theory of "torsion" predicts that light and subtle energy are coupled together. When an electron wiggles, making a photon of light, it also creates a torsion wave of subtle energy. Just as torsion or subtle energy affects light, it also affects virtually every other force known to physics...subtle energy affects gravity, mass, time and many other physical properties...subtle energy also interacts with consciousness." Subtle Energy Research Institute reports describes this energy as " "It is the bridge between current physics and many anomalous effects which have been observed in the laboratory but which violate current science. The presence of subtle energy is believed to modify current physical law introducing a variety of phenomena related to consciousness and paranormal phenomena...Subtle energy is a confusing subject for the Western scientist...it responds to and interacts with thought, making it unlike any known force." "We were staying at the Camelot Castle Hotel in Tintagel, Cornwall. I was taking a photo as my mum sat on the sofa. I found this hotel to have very interesting energies. It sits on the cliffs of Tintagel and below is Merlin's Cave. Well worth a visit!" My husband, Bill Ryder, took these three photographs of me interacting with a time tunnel on August 12, 2013 which is a twenty year incremental anniversary of the Philadelphia Experiment. See Star Nations Page for more. 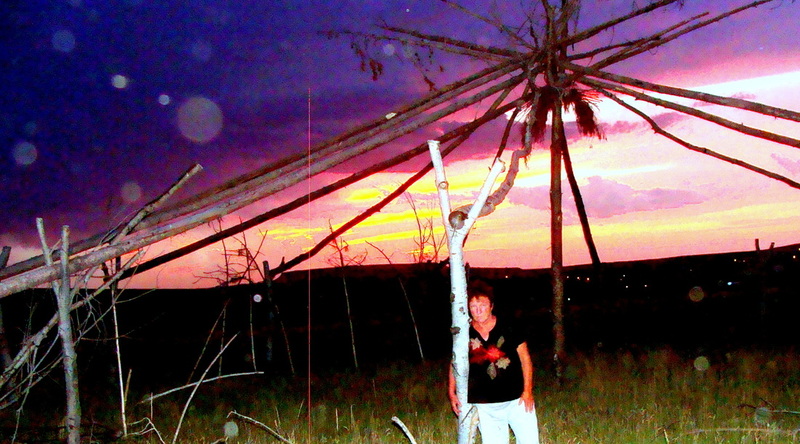 After days of drumming and dancing and nights filled with TeePee dreams the resonant energy field is vibrating. An energy stream streaks from the center pole to the forked support tree trunk I am leaning against while orbs appear in profusion. ​Note: The pink vertical line is a camera defect that began to appear in my photos after I dropped my camera. I have a single pink stripes that appears the same in other photos that have been taken in dim light. An orb appears over Ryan's head. Note the double membrane that formed in all three permutations of the orb layers. Ryan attended the second Quantum Camp in 2008. He recently sent these photos with permission to post them on this website. The orb formed a tube torus (wormhole) which surrounded Ryan as his friend smiled at the camera. There is growing evidence and video documentation that some of the authentic crop circles are formed by balls of white light identified as orbs. We finished the wooden horse around midnight during a soft October rain. Early Saturday as Bill was loading our latest creation Orbs appeared in the just-before-morning sky to accompany our horses to Market. Orbs surround the metal horse created by my husband, Bill Ryder. This metal sculptured horse can be viewed on North Montana Avenue in Helena, Montana. This is an excellent location for taking orbs photos. 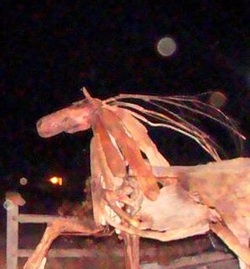 We walked among the Spirit Horses in the moonlight on a vast prairie where ancient spirits ride the wind. Roberta and I met in a bead store over a medicine bag. After being with her horses I arranged a grant to bring severely mentally ill clients to work with these horse healers. A Blackfeet Medicine Man renamed this dark horse BLACKIE as the horse imitated the Medicine Man and followed him step for step. Orbs appear in multiple colors and configurations as Roberta CrossGuns expresses appreciation to her ten therapeutic horses for the healing they have facilitated. The horses specialize in working with PTSD, Veterans, severe physical conditions, mental illness and autism. Children love the horses and are perfectly safe with them. Spirit Horses are settling into their new home near the First Nations Buffalo Jump Site near Great Falls. 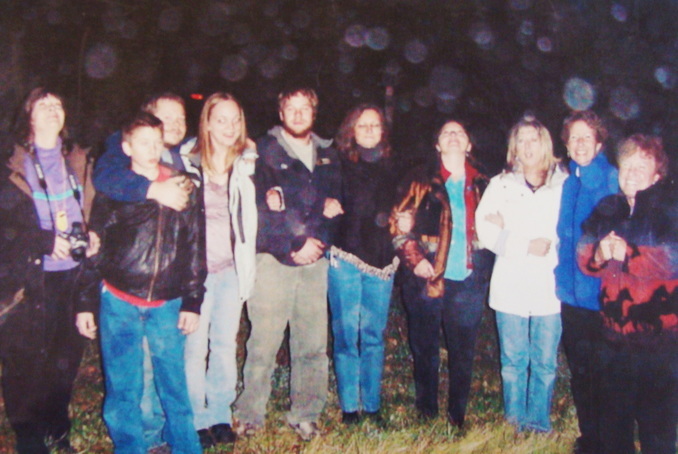 Orbs fill the sky in Washington State just before the photograph of the Blue Orb was taken in 2003. This crop circle shows intersecting and overlapping circles similar to the orbs at the center top of the orb photograph shown on the left. After the photgraph of the Blue Orb was taken the sky fills with diamond and circular orbs. A definitive membrane of intense white light forms the border around the periphery of these diamond shaped orbs. The Keepers of Ancient Knowledge: The Mystical World of the Q'ero Indians of Peru, by Parisi Wilcox describes the beliefs of the Q'ero, who are believed to be Inca descendents. "The Q’ero tell us that the real significance of 2012 and the prior period of transition is very much related to a massive change in our reality caused by a sweeping change in the background electromagnetic quantum vacuum or space-time. Since space-time is a multi-dimensional plasma, geometrically organized sub-atomic particles, it helps to explain the 'orb' phenomena and especially the increasingly seen geometrically shaped plasma objects like triangles, diamonds and squares. In this process, humans are being requested to re-connect to higher dimensional energies and evolve based on new templates designated by universal consciousness." 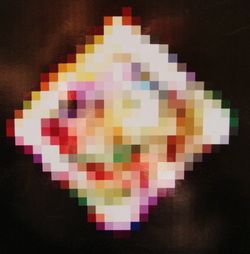 This photograph of a diamond shape orb was enlarged until it pix-elated. 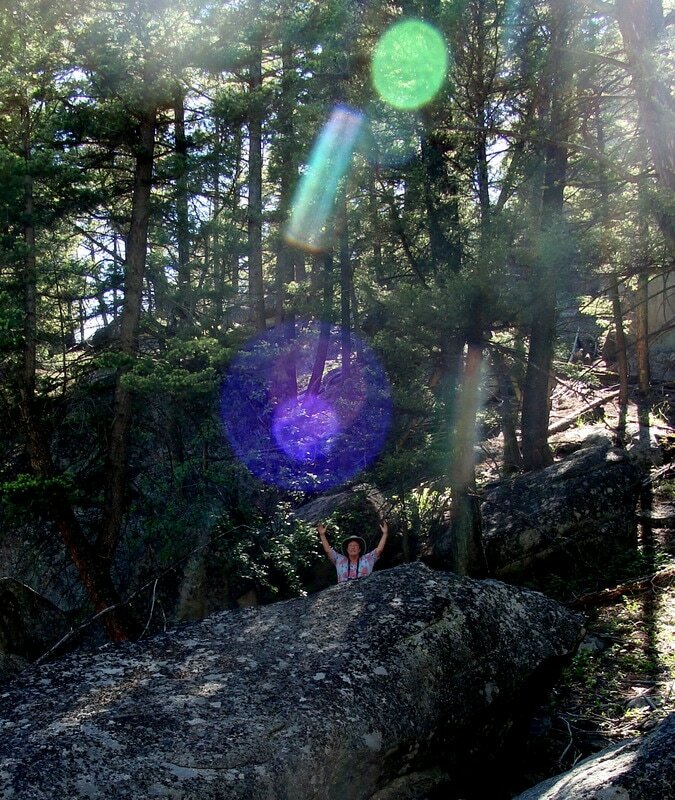 Bill dancing with diamond orbs at a rock cairn on top of a mountain in Montana. Mandelbrot Set orbs appeared above our heads in three photographs taken in 2003. A Mandelbrot Set orb appeared above my husband, Bill Ryder. This Mandelbrot Set crop circle formed near Ickleton, Cambridgeshire in England On August 12, 1991. Note the August 12 date which is the same date that the Time Tunnel opens every 20 years. A Mandelbrot Set is a fractal which is a mathematical model used to describe the permutations of the way things grow in nature. Fractals are the mathematical basis of chaos theory. Fractals are natural repeating patterns in nature that display self-similarity at various scales. A Mandelbrot Set is generated from complex numbers which are different from real numbers. Complex numbers have a real component and an imaginary component just like the human experience. www.ddewey.net/mandelbrot/. A crop circle showing the exact position of the planets in our solar system on the date of December 21, 2012 appeared in Wiltshire, England in July of 2008. ​Viewing this graphic triggered a epiphany. Suddenly I understood that many of the orb photos which show concentric circles are exact dates. The circles positioned on orbital paths show the position of the planets in our solar system on a specific moment in time. The orb photo taken by our friend Colleen in the Cathedral in Helena, Montana. Colleen's work is familiar to readers of the Enlightened Catholicism blog. Note the darker small circles in the concentric rings and then compare this with the graphic of the crop circle. I do not have the expertise in astronomy to decipher the exact date depicted in this orb. Hexagrams are the basic structural shape of the solid universal matrix. A primary symbol in Star Nation Language hexagrams appear in sacred symbols and in glyphs and art of ancient cultures. 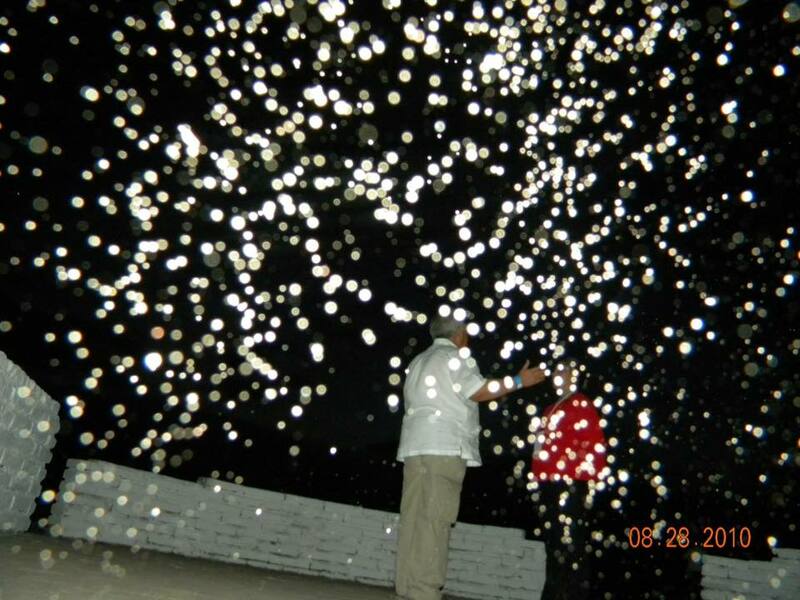 My husband, Bill, was photographing a manifestation above him during a Shamanic Journey weekend at our home. Asymmetrical hexagons of light form all around Bill Ryder. Hexagrams are a primary symbol in Star Nation Language. 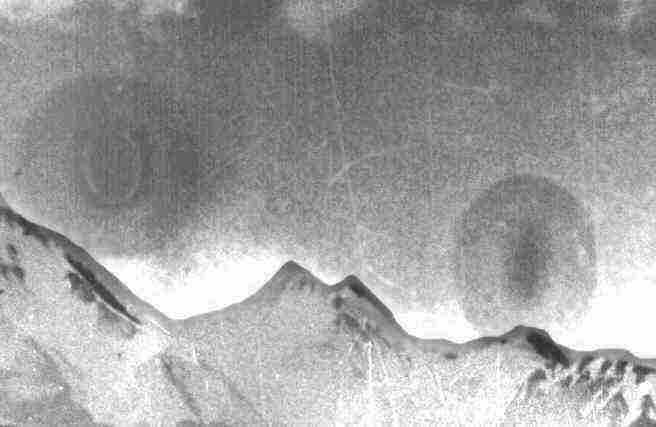 Here they are shown in orb photos, cymatic symbols, symbols of light produced by sound frequencies of Tibetan Bowls, on the north pole of the planet Saturn, in the crystal skull, and in a crop circle. Inside of the Whale Dolmen a hexagram of pure light appears over James's head when the Tibetan bowl is played at a specific frequency. Hexagrams appear in a crop circle in England. On On Saturn a six-sided hexagram feature encircles the entire north pole. This vortex is 15,000 miles across. Four earths could fit inside. model ...) around the exact rotational axis of the planet! Cymatic symbol of the piano note B2 forms a hexagram in the center. 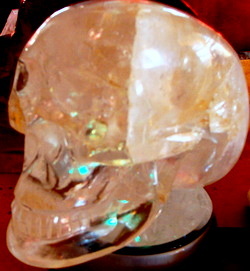 In this photograph of the light crystal skull a hexagram forms over the nose region with a triangle below it. This configuration does not appear in other photos of the same skull. In the beginning days of photographing the orbs we were asking questions such as: are the lights two or thee dimensional geometric forms? My friend Colleen took this orb photo that appeared on her couch. Question answered. 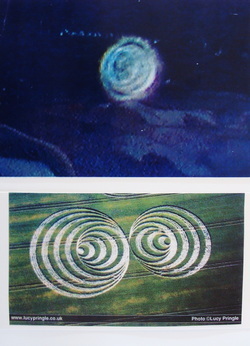 On June 30, 2006, the same configuration of a torus was formed in a crop circle in England. "Crop circles also show existence of ultrasound, and such frequencies are known to exist at ancient sites such as stone circles and menhirs. And like all ancient sacred sites, crop circles appear at the intersecting points of the Earth's magnetic pathways of energy; thus the size and shape of a crop circle is typically determined by the area of these 'node' points at the time of their appearance. This electric and magnetic energy can interact with brainwave patterns, and because the human body is itself electro-magnetic, crop circles are known to affect people's biophysical rhythms. Consequently, it is not unusual for people to experience heightened states of awareness and healings in crop circles — a situation also common to sacred sites and holy spaces." Read about the energy grid line of ancient sacred sites on Earth Energy Grid Page. Torus spiral orb left of David's head. Torus spiral in crop circle. A double spiral appears to the right of David's head. 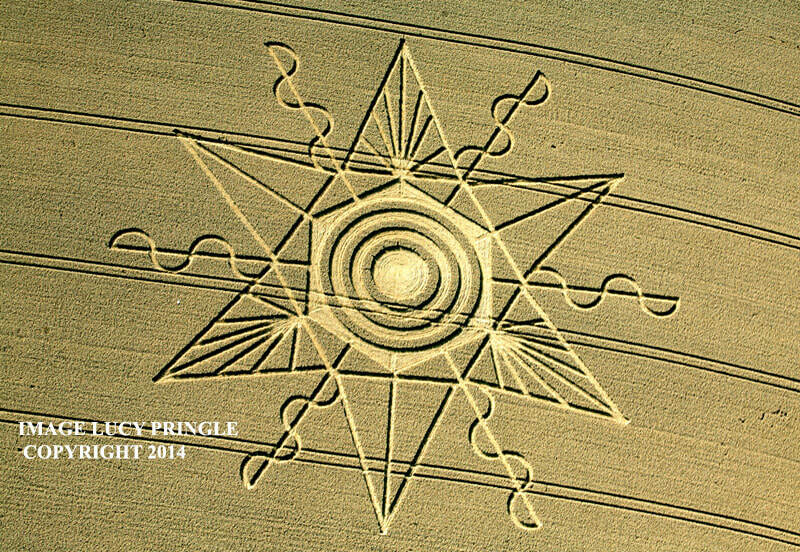 This same double spiral configuration appear in a crop circle and in a pictograph in New Mexico. See more about David on the Quantum Kids Page. Nathaniel holds an orb in his hand. See complete photo of Nathaniel on Quantum Kids Page. The double membrane crop circle also shows a circle in the center. This crop circle is in binary code. 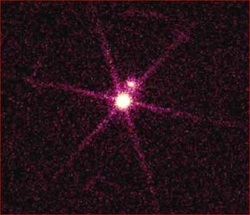 Sirius B photographed by NASA shows a 6-spokes wheel pattern. The 6-spokes wheel pattern also shows in a magenta orb photo and in a crop circle. The 4-spokes pattern magenta orb on the right in the orb photo above matches a photo of Sirius A and B shown on right. 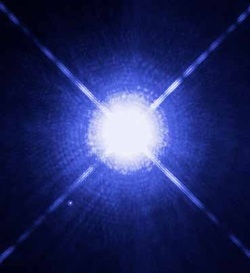 Sirius is the brightest star system in the night sky. Sirius A and B photographed by NASA. 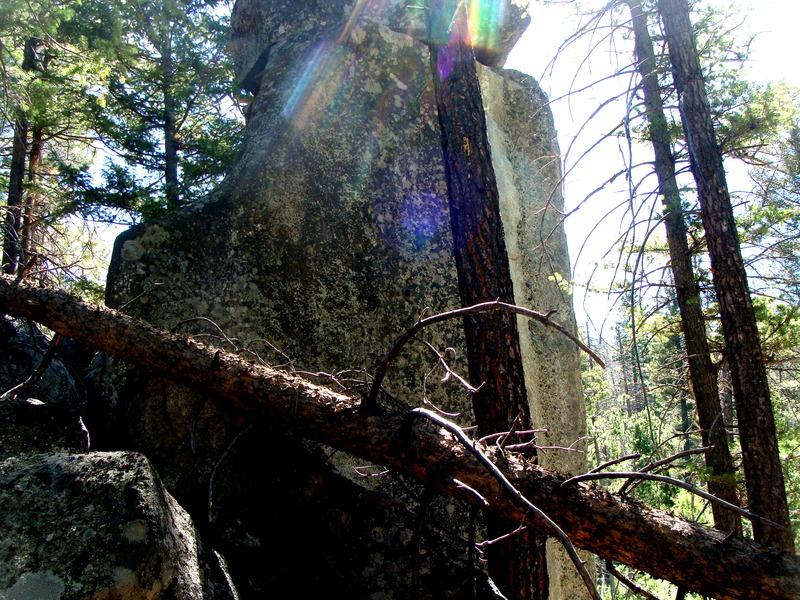 Orbs often show up at Pictograph sites. 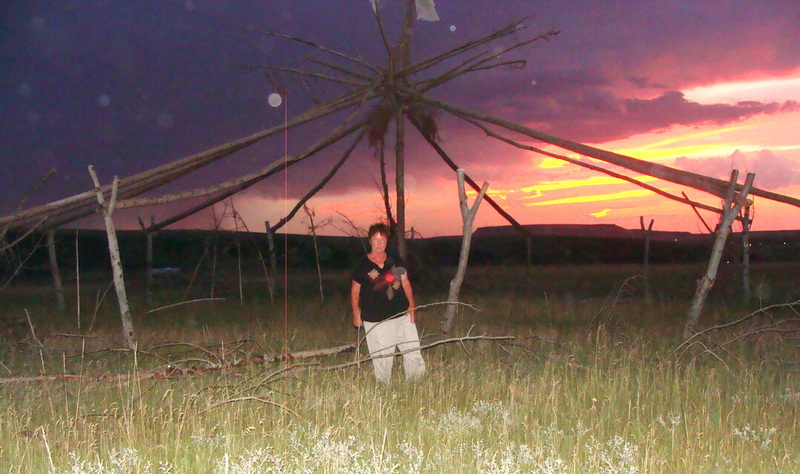 At the Feather Pipe Ranch near Helena Montana during an encampment orbs and light form above the lake and Tee Pee. In August 2013, violet and green orbs glow over the alter stone of the replica of Stonehenge on the Columbia River in Washington State. Hot Springs delight in a phantasmagorical experience as diamond orbs form in profusion. Janet Spencer took this photograph of tubes of light coming in over my head at Celebrating Women. Last summer Bill and I were showing these photographs to Merle Yellow Kidney (Blackfeet) and his daughter. Merle stated that the orbs we see as circles are the ends of tubes of light coming from the World of Spirits into our world. 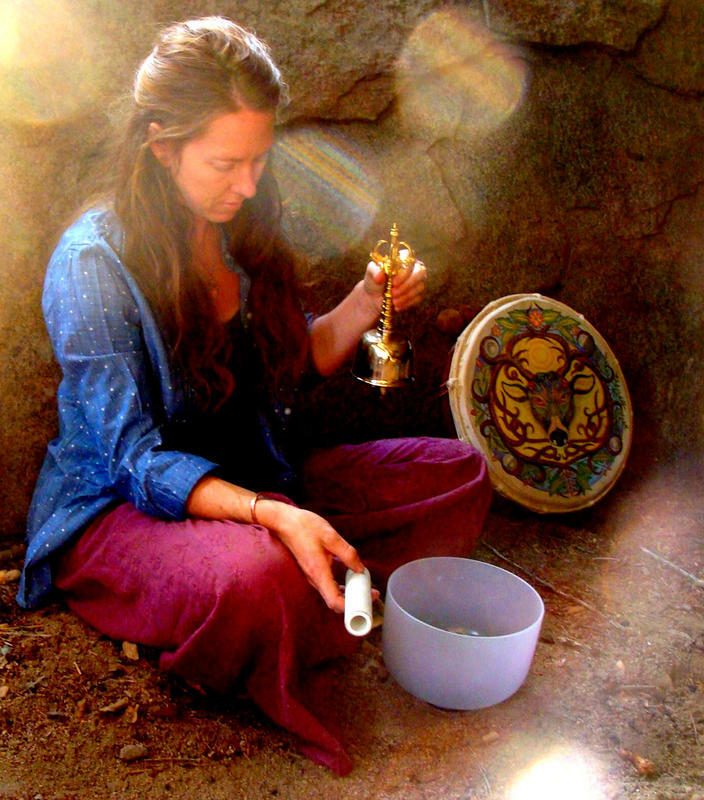 The first time I saw an orb with my own eyes was at a gathering at the Featherpipe Ranch near Helena. Tibetan Monks were chanting as the vortex of energy increased. I caught the image of a ball of light in my peripheral vision and turned 90 degrees to see the incoming white orb. 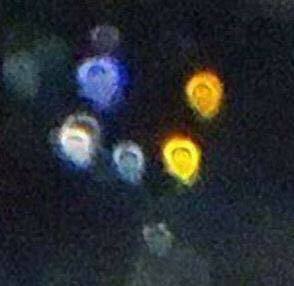 Some "experts" were claiming that orbs were simply dust particles or flash effects from digital cameras. This photo was taken with a 35mm camera, black and white film and no flash as the morning light penetrated the windows of the No Sweat Cafe. Look closely and you will see an oval light formation over my head. The elderly professional photographer that took this photograph had always used black and white film. She insisted that she would take orb photos the same way. She did. 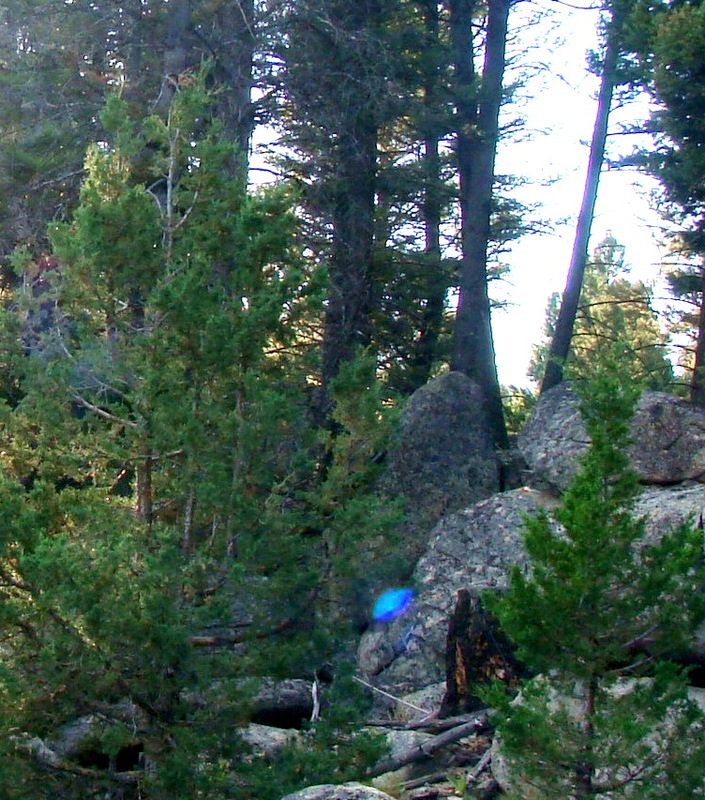 A Great Gray Owl communicates with a Star Kid as a large white orb appears near the Boulder Dolmen.